U.S. Citizenship and Immigration Services (USCIS) issued a policy memorandum clarifying when petitioners and attorneys may submit comparable evidence for the O-1 Individuals with Extraordinary Ability or Achievement work visa. This visa classification is typically used by high profile performers, professional athletes and film actors. Before the memorandum, the petitioner had to prove that all or the majority of the eligibility criteria did not apply to the foreign national before he or she could submit alternative forms of evidence. Under the memorandum, the petitioner must only prove that the types of evidence in the document list don’t naturally apply to the position. The memo also clarified that a petitioner can substitute comparable evidence for any number of the items on the standard document list. Previously, it wasn’t clear how many items could be substituted. Anyone who has an opinion on the policy memorandum may comment by emailing ope.feedback@uscis.dhs.gov by Feb. 22. State the title of the relevant memo in the subject line of your message. Refer to a specific portion of the memo. Explain the reason for any recommended change. Include data, information or authority that supports the recommendation. The policy memorandum can be read in its entirety here. 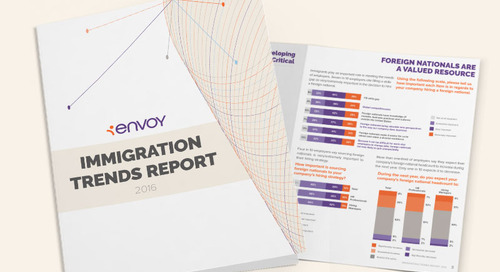 The post New Memo Clarifies Comparable Evidence for O-1 Work Visa appeared first on Envoy.